A small update on how the development of the first game is going. So far I've been pretty happy with the way things go. I haven't really been able to keep on track with my pre-planned schedule but that doesn't bother me as much as I though. The first day was pretty solid but too short for me to do all the gameplay programming. I also still wanted to find the fun part of the game which only really came up yesterday (day 3). So far I've mostly been working on getting the gameplay as much fun as possible as well as enabling myself to test out different things faster. The concept changed somewhat from the one that I posted before. A fun part about game-development is that you can (and should) listen to what your game needs. I added shooting and removed the LAZOR-cutting part from the concept. It just didn't feel fun to only be able to destroy stuff with your lazer and it was also terribly difficult to do so. 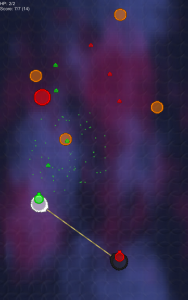 Instead the game is now fun due to the difficulty there is because you still control two ships... Which can shoot... But only if the other is not shooting and the lazer is not interrupted by an obstacle. According to the planning I made before day 3 would be about content and levels. I tried to approach the game with levels/waves but that just didn't feel easy enough to make so I abandoned that idea quickly and switch to endless-random gameplay. This might change but for now it feels fun. Content wise there is still a lot of things I want to make, especially more types of ships, turrets, bullets and enemies. The good thing about this is that they are really easy to make and test so I'll probably focus on some of the should-have's before continuing with those. The picture shows how the game looks at this point. I used some art from games I made before and changed them a bit to fit their needs for this game. It's not super fancy but I like the style so far. Tomorrow will be UI, sound and hopefully some more should-have features.